Most medieval browser games such as Samurai Dynasty feature resources that need collecting so you can build your city and raise an army. Outside your main city in Samurai Dynasty, you have food, wood, stone, and iron plots for your resources. As you upgrade each of these plots, you’ll receive more resources for your city. If you upgrade your town castle, you’ll also get more plots for resources. Build houses inside your city walls to gain silver and raise the tax rate from your castle. Be sure to click the “collect resources” button to bring your resources out of storage so you can use them. In the academy research terrace farming, logging, stone masonry, and smelting to increase your resource production speed. These technologies should be the first ones you concentrate on since you need resources more than troops in the early stages of your game. To increase your resources further, attack other players to loot them or hold resource points on the game map for additional bonuses to your production rates. To protect your city from attacks you have several defensive options. The first thing you’ll need to build is a wall. You have several defenses for the wall including wall archers, throwing stars, traps, defensive ballistae, and defensive cannons. Each one of these defensive needs building upgrades and technology research before you can use them. Any technology or other upgrades you need are highlighted red so fulfill the requirements to gain access to them. Start with wall archers and then unlock the other defenses for your town. 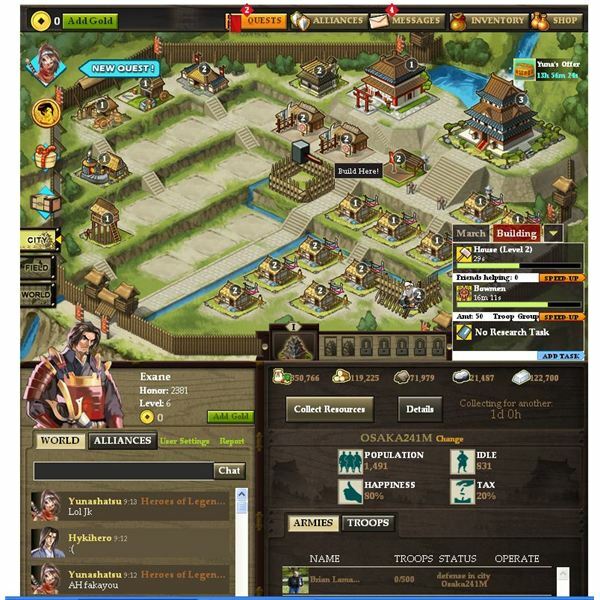 In the game, you have several units to build and the ability to hire Facebook friends as generals. Access the general quarters building and assign a friend to one of the roles. You can assign a general to defense, resource production, training speed, research speed, and building construction speed. Click the appoint generals button to find a Facebook friend for the role. Your friend doesn’t have to be playing the game to become one of your generals. Build a barracks and a rally point to train up your army. Units include peasants, supply oxen, archers, mounted ashigaru, spearmen, musket men, supply wagons, mounted samurai, kensai samurai, cannons, and siege ballistae. Each unit requires specific technology and building upgrades before you can use it in your army. In the early game, you’ll want to complete the quests to get some needed resources. You can do the recommended quest at the top of the screen or just follow the quest path. Quests involve building structures, upgrading, or making some type of unit. Try to do quests in order so you have spare resources to complete the next quest or you’ll need to wait and waste valuable time. Upgrade your academy and research technology as much as possible in the early game. In the first few days, you’ll want to have several levels of each technology but focus on the resource technologies first. Get conscription next to train units at a higher speed and then pick the other technologies. Check the barracks and see which technology you need for each troop type. When you start another city, you just need the proper academy level you don’t need to research each technology over again because you’ll already have it from your first city. 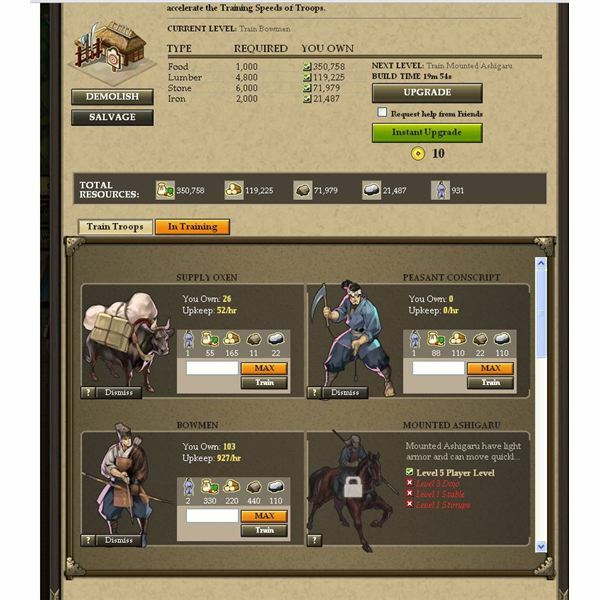 A common mistake a new player makes to browser games like Samurai Dynasty is building an army in the beginning. In the first few days, you should focus on just your resource production. Build your homes up to a high level and develop every free plot of land. Try to upgrade each resource plot to level five or higher so you have a nice steady supply of resources coming into the town. It makes no sense to burn all your resources on one hundred archers when you could put those resources into upgrading a lumber mill another level. Joining an alliance is a good idea since you can trade resources back and forth when you are running low. Once your economy is running well, develop your army and start conquering. All images from Samurai Dynasty. Source: Article is author's own experiences playing Samurai Dynasty on Facebook. Your guide to Samurai Dynasty on Facebook.